I read this a while ago now, but didn't review it at that point. Between the time that I finished this and today, I've also discovered the CBC tv series Kim's Convenience, also about a family from Korea who runs a convenience store in Toronto. That, however, being a tv show, is a bit lighter and less intense than this book. I loved the show, and have to admit that I thought of Janet, the daughter in Kim's Convenience, when I revisited Mary in this novel. Mary, or Yu-Rhee, is a teenager in the 80s, when her family (parents, one brother) have moved to Toronto from South Korea and are trying to make a better life for their children with their convenience store. Mary and her brother Josh experience many of the issues that new immigrants face; the clash between parental values and those of the new social groups the children are forming; high expectations of achievement; racism, whether subtle or not; and the fact of having to work very hard to solidify a new life. Through the store, Mary meets many locals -- ranging from prostitutes to families to other store owners -- and this means the reader gets an overview of 1988 Toronto, in both its ethnic and socioeconomic diversity. Being a teenager, Mary has difficulty relating to her parents. She finds understanding in a high school English teacher who she has a crush on (and who is a weak, snivelling, taking-advantage kind of character who I despised). But when she finally gets to university, she finds a teacher who truly inspires her to take ownership of her own life, and her own story. Mary's path is as much about writing as it is about surviving. Unfortunately, while the premise is strong, and there was much to enjoy, I also found the writing style a bit dry and expository. I wasn't drawn into Mary's very eventful life as much as I'd expected, finding there was perhaps a bit too much "event" packed into a bit too little story. The book starts fairly reasonably, a family story that promises an emotional journey. 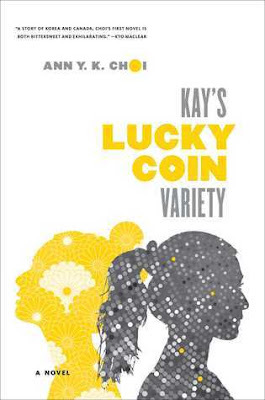 Then all sorts of things start happening; accidents, attacks, quickly souring relationships, bad behaviour leading to disgrace, violence -- it started to feel as if Kay's Lucky Coin was a misnomer of a name, like the letters "Un" had fallen off the sign somehow. Nevertheless, I still thought that this was a pretty solid story overall about a Korean experience that I'd like to hear more about. I'll be interested in what Ann Choi does next. I felt like the sense of distance that we had as readers was perhaps due to the fact that she was longing for connection herself, that she was having difficulty reaching even those to whom she might have been closest; I, too, am curious to see what the next book she writes will be like. That's a good point - the structure/style reflects the character's perception. She was an interesting main character, with a lot going on, certainly. Thanks for sharing some honest thoughts about this book. I have never heard of the TV show you mention (but it sounds good). It's a smaller Canadian show so I'm not surprised you haven't heard of it -- but it's really great! I'm glad to hear it! I know many people who really loved this book; I liked it but had a few reservations, as noted. Did you know that Kim's Convenience started as a play? It was originally done by Soulpepper Theatre and is on again currently! I haven't read the play, but have seen it. I'm sorry to hear that this one fell flat but I'm definitely intrigued enough to give it a read! Yes, I did see that the play was touring again! I haven't seen it though, or read it. I plan to read it soon, as I'd like to see the source of the show. Hope you will find this book interesting if you do decide to pick it up, as well!